If you see baby roaches in your home what does it indicate? It shows that you have a major problem. Baby roaches are a sign of severe pest infestation, and you are going to be seeing many more if you do not take immediate steps to stop their growth. In this article, you will find detailed information about baby roaches and the best way to get rid of them permanently. Baby roaches come from eggs that are laid by female cockroaches. Each egg contains not one but 16 or more cockroaches depending on their species. For example, an egg of German roaches can hold up to 60 eggs. The eggs hatch when the hatchlings inside try to expand themselves. When they emerge from the egg, these hatchlings are bright white. They are called nymphs and are very small in size. However, they turn darker in just a few hours. At this stage, baby roaches look like ants or termites. Their white color and small size allow them to move around the house without being detected. At this stage, they can easily get inside pantries and containers with small openings and contaminate food. At the time of birth, baby roaches are only 3mm in length. Unlike adult cockroaches, baby roaches do not have any markings and are smooth in appearance. They have soft bodies that harden over time. Similar to the adult cockroaches, baby roaches have a head, small legs, and a pair of antennas. However, they grow quickly going through a few shedding phases before reaching maturity at around 40-160 days after birth. As baby roaches grow, they get quite large, change color, and have different markings depending on their type. Baby roaches do not have wings; therefore they cannot fly. They crawl around in the shadows not preferring to come out in daylight. They also like to stay close to the place where they hatched until they develop wings and can go further to look for food. The nymphs like to hide in places that offer proper temperature, food, and moisture. A baby roach sheds its skin many times before it reaches maturity. 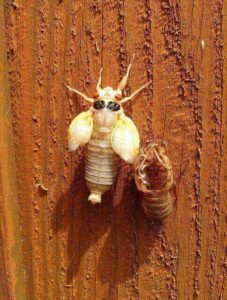 This process is called molting and the number of molts a baby roach goes through depends on species and outside factors. These molts can range from 4 to 14 times; therefore, size differences can be drastic. 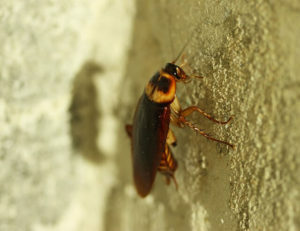 Most cockroaches are subtropical or tropical and as a result, prefer to live outdoors. However, some species have adapted to living with humans and can be found in our homes. It is a common misconception that cockroaches only infest dirty houses. Although cockroaches thrive in grimy, clutter-filled spaces, they are also known to invade even the most well-organized and cleanest spaces and homes. Roaches enter our homes through bags, boxes, dried pet food, and used furniture. They also invade our houses through open windows and doors, sewage and water pipes, and over electrical lines. 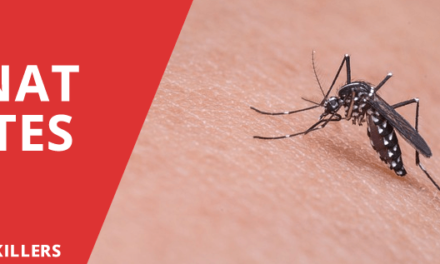 These pests usually make their homes in dark, humid, and warm places and often reside in cracks under, around, and inside cabinets and cupboards especially in the bathroom or kitchen. 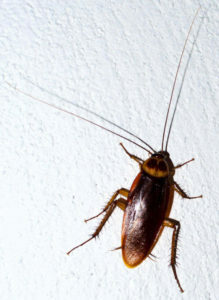 There are more than 3,500 species of cockroaches in the world, but only a few are known to live in buildings and homes. All cockroaches grow by gradual metamorphosis regardless of their species. German cockroaches are the smallest species of cockroaches measuring just ½ to 5/8 of an inch in length. Although small in size this species of roaches are the most prevalent type of roaches. They are light brown in color with two dark stripes running lengthwise along its head. Even though it has fully developed wings, it rarely flies. Baby German roaches are even smaller than adults, don’t have wings, and are darker in color. Unlike other types of roaches, the adult female of German roaches doesn’t leave or attach her eggs on any surface. Instead, she carries the egg capsules on the abdomen, until they are ready to hatch. 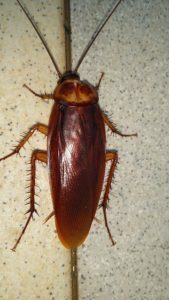 German roaches can be found in various buildings such as apartments, condominiums, homes, and commercial food establishments. German roaches, like other roach species, enter through furniture, dried foods, or through crevices and cracks in the structure of the building. They seek dark shelters near moisture usually in the bathroom or kitchen. They have a lifespan of one year. The egg sack of German roaches contains up to 50 eggs. This high number of eggs helps in rapid reproduction. An ootheca (egg sack) is produced every three or four weeks. After hatching, the nymphs of German roaches require just 36 days to turn into an adult and start reproducing. The eggs of German roaches are much thinner than other species eggs. Typically it takes just five hours for the nymphs to come out of the capsule. The nymphs of German roaches are white when they are born, but their exoskeleton becomes darker after they absorb a handsome quantity of oxygen. This species of roaches are also very tiny just like the German roaches. 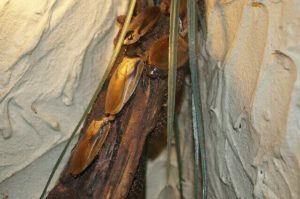 With just ½ to 5/8 in length, the color of these roaches ranges from light gold to glossy dark brown. It has yellow bands along the abdomen and on the base of wings which are more prominent on nymphs than on adults. These species also have wings but unlike German roaches are active flyers. Males are especially known to fly rapidly when agitated. Brown-banded roaches are commonly found in apartments, hotels, homes, and large spaces including nursing homes and hospitals. They usually hide in small, dark places especially behind picture frames, or in closets or cabinets. Unlike other roaches, this species isn’t drawn to humid places preferring the drier parts instead in the building. They love starchy food and need less water than other species. They live from three to eleven months. The ootheca (egg sack) of brown-banded cockroach is light red mixed with a little brown. A female brown-banded cockroach produces about 20 egg cases during its lifespan. Each egg case is 5 mm in length and contains up to 15 eggs. Females carry matured ootheca cases for 2 to 3 days before attaching them to a safe surface. The nymphs need an average of 3 to 6 months to mature depending on food, temperature, etc. Adult American cockroaches are larger than German and Brown-banded roaches, measuring up to 1 ½ to 2 inches in length. Both male and female are reddish-brown with fully developed wings although they usually do not fly. The female American roaches need only to mate once to produce multiple oothecae as they can store sperm. Females drop their egg sacks within a couple of days after they are usually formed near water. This species of roaches have well-adapted to living with humans. They can be found in most commercial, and home buildings as these places provide an abundant supply of food and shelter that American roaches prefer. They prefer dark, humid places; therefore can be found in basements, bathrooms, kitchens, crawl spaces or sewers underneath your building or home. They can live up to two years. Similar to German roach eggs, the eggs of American roaches grow inside the ootheca. However, the number of eggs inside the sack could reach up to 90 which is 100% more than the German roaches eggs. The egg sack of American roaches is long-shaped, brown in color, and approximately 0.9 cm in length. The nymphs need at least 6 to 8 weeks to reach maturity. A nymph goes through 13 stages of molting before it reaches maturity. In most cases, a little over five months are needed for this transformation. American roach female produces an average of 150 young in its lifespan. Oriental roaches are smaller than American roaches with the females measuring one ¼ inch while male oriental roaches measure just 1 inch in length. Although both male and females have wings, neither of them can fly. They are glossy brown or dark in appearance. Their lifespan is for six months. Oriental roaches mate in spring. Around this time they usually move outdoors and spend the summer months there. During this time they prefer to make their home in compost piles, landfills, flower beds, and lawns. They also like humid, moist environments and can be found in drains, kitchens, and damp, dark spaces such as basements. In the fall oriental roaches move inside to spend the colder months. 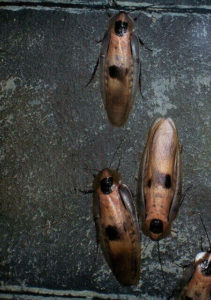 The oriental roach oothecae are black-brown and are produced one day after mating. The egg sack is usually 10 to 12 mm in length and can hold up to 17 eggs. These eggs are initially light yellow which changes to red before finally changing to dark brown. These eggs do not hatch if the temperature drops below 0 degrees Celsius. The most suitable temperature for the eggs is around 29.5 degrees Celsius at which the eggs take about 42 days to hatch. However, if the temperature drops this time may increase to 81 days. Most female cockroaches drop the egg sack on a surface where they hatch. Once these eggs hatch on the surface nymph cockroaches emerge from them. Though the nymphs share similar physical features with adult cockroaches, they are relatively smaller and don’t have fully developed wings. Their body is long and flattened with prickly legs that help them to run faster and squeeze into tiny crevices and spaces. Baby roaches also have a different coloring as compared to their adults. Before maturing into adults, nymphs molt several times. 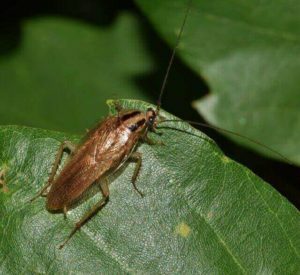 The time required for an adult cockroach to complete its life cycle depends on its water and food sources and its environmental conditions. It can range from two months to three years. Baby roaches leave behind traces of their existence wherever they go. They contaminate the environment by leaving bacteria and droppings around your home along with antibiotic-resistant strains. These bacteria can cause dysentery, diarrhea, and food poisoning. Cockroaches molt several times during their lifespan. 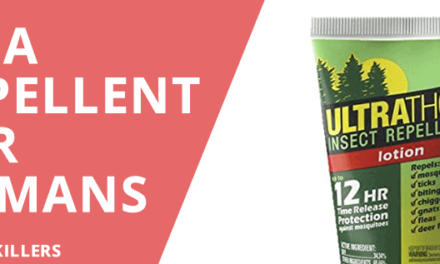 They leave behind parts of their body that can be a major cause of asthma, allergies, and other breathing problems. You might be suffering from a roach allergy if you have a skin rash, stuffy nose that just won’t clear, and year-round respiratory symptoms such as wheezing, chest tightness, and coughing. Cockroaches can also cause Typhoid and Polio. It is very rare to spot a white cockroach; however white cockroaches are not rare at all. Every cockroach turns white various times at different stages of its life. 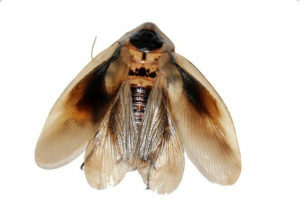 Typically, cockroaches are white when they hatch or after they have molted. This is the stage when their outer skin or exoskeleton has not set yet and has to turn dark. After hatching or molting it might take several hours for their skeleton to darken in color and harden. When roaches molt they not only shed their outer skin, they lose most of the pigmentation in their body. This is a chemical reaction that takes place in the body, and it usually takes a few hours to restore pigmentation. Why Are White Cockroaches Hard to Spot? White roaches are highly vulnerable to attacks by predators and drying out just after molting. We do not see white roaches too often because they stay hidden out of moving air and light to protect themselves from injuries and predators. Without their hardened protective exoskeleton it is very difficult for them to move around freely and quickly. Therefore, they keep out of sight to keep alive while they are white. The process of getting rid of baby roaches is similar to that of getting rid of adult roaches. Whether the roaches are in the kitchen, bedroom, or bathroom, the same method will work to exterminate them. 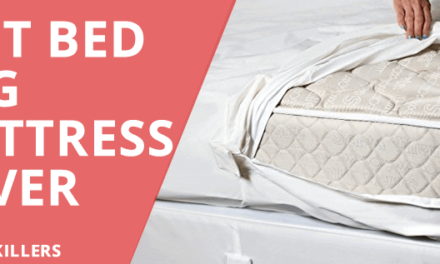 By using the following methods, you can effectively get rid of baby roaches in your home. It is suggested by experts that before spraying insecticide or laying down powders, you should use traps. When you catch the roaches with these traps, you will get a better idea of how big the nest is. If you do not catch any roaches, you can place the trap in another location to find out exactly from where they are coming from. Once you find out the location of the nest, you can use insecticides and sprays. Mix one part sugar and three parts boric acid and sprinkle it under the stove and dishwasher, behind the refrigerator, in the cracks along the edges of pantries and cabinets, and under the sink. The sugar attracts the roaches while boric acid eliminates them. 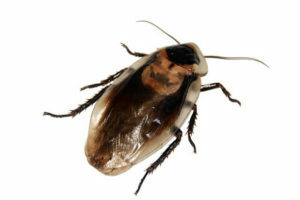 Although boric acid is not harmful to pets or people it can cause irritation in some cases; therefore, it is best to keep Cockroach Bait away from the reach of pets and children. If you have got a big roach infestation and you want to get rid of them, naturally you can hire an exterminator. They have the skills, knowledge, and tools that help them find the nest and exterminate them. Most exterminators use chemical sprays and poisons to get rid of roaches. 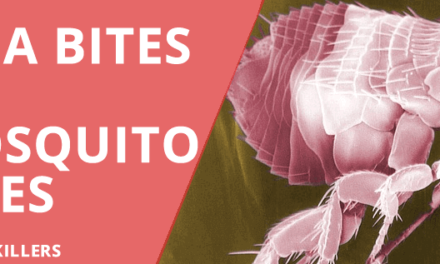 Try to find a pest company that uses safe, natural methods such as diatomaceous earth to get rid of roaches. Diatomaceous earth, a soft sedimentary rock, can be easily crushed into fine powder. This acts as a mechanical insecticide as it causes the roaches to die without using any chemicals and is completely safe for your family. Cockroaches are attracted to food residue especially grease. If you eliminate food, there will be no reason for them to stick around. Keep all food in airtight containers and Ziploc bags. Don’t leave food open, lying around. Wipe down counters especially after preparing food or eating. Clean thoroughly behind and underneath the appliances. Sweep the floor before going to bed. Baby roaches can crawl through the tiniest of places. Therefore, it is important to seal the entries to your home and the cracks between the countertop and walls, in the baseboards, and inside the pantry. You can use a caulking gun and tube of caulk for this job. 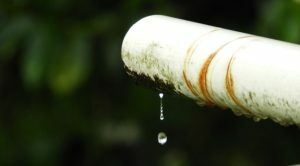 Roaches are attracted to water from leaks in the pipes and moisture. That is why you can often find them under the sink. Although roaches can survive for days without food, they cannot survive without water. You can close off their water supply by repairing leaky pipes. You should also take care not to let water stand in the sink and don’t overwater indoor plants.